The RPK (Ruchnoi Pulemet Kalashnikova = Kalashnikov light machinegun) was developed as a light support weapon, and had been issued in Soviet Army by one per infantry squad (10 men). It has been officially replaced in service by RPK-74 but in fact is still in use with many 2nd line and non-infantry troops, as well as with other Para-military organisations in Russia and other states. Basically, the RPK is a AK-47 (AKM) assault rifle with sturdier receiver, heavier and longer, non detachable barrel, and re-contoured wooden buttstock. The sights were re-calibrated according to longer barrel, and the rear sight has a windage ajustments. The non detachable, folding bipods are mounted undder the muzzle. RPK can be fed from special 40 rds box or 75 rds drums magazines, as well as from standart AK-47 type 30 rds box magazines. 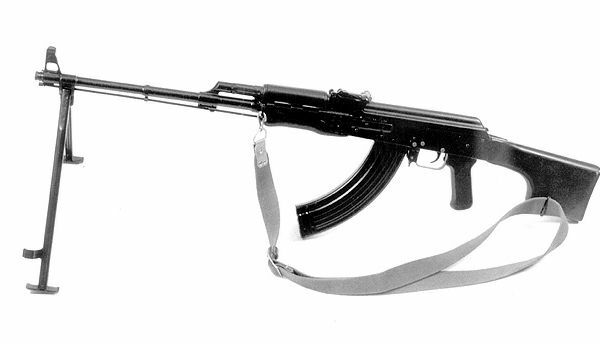 The paratrooper version of the RPK, called RPK-S, had side-folding wooden buttstock. Serial and factory mark on left of receiver.